Due to the recession, the NHS budget cuts included cutting the position in London. 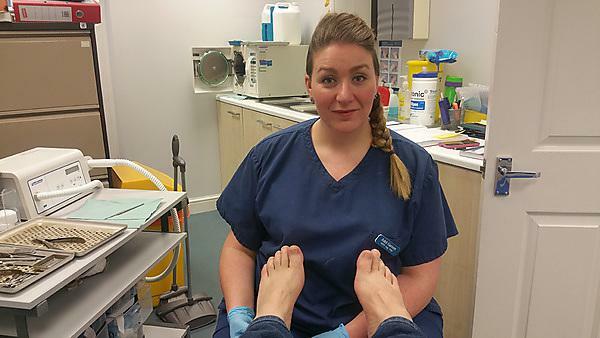 I started a private mobile podiatry business as a result, and as that steadily grew I then rented a clinic space in two established clinics in the area. Keeping on top of paperwork can be difficult, but must be done! Listening to patients concerns and life stories can be very tiring day in day out, as well; so having patience and an unbiased opinion can be difficult. I volunteered for the charity Crisis, working Christmas Day and Boxing Day, providing podiatry treatments to the homeless in London. It was an amazing experience and I look forward to doing it again. Do your research and talk to a working podiatrist for an insight into the world of podiatry as this will give you an idea of the day to day running of things. Have patience and be able to listen well. I undertook a number of clinical placements which turned out to be of great value. These placements gave me the opportunity to see a wider range of issues and conditions that helped to prepare me for working life after graduation. You learn a lot by working in a clinic, and establishing good relationships with your patients makes working life enjoyable. If you work in the private sector, word of mouth means everything! Plymouth's podiatry school is a fantastic place to train, the facilities and opportunities are great, and what’s more there is a great view out onto Dartmoor! Absolutely yes, because the BSc (Hons) Podiatry course at Plymouth University is well run and the University itself is growing in reputation – plus, you’re in a fantastic part of the country.